We all know that the communications world is heading towards 5G. But, how will we get there? The good news is that we don’t have to take it all in one giant leap – there are technologies that will bridge the gap between where we are now and our destination. The major steps are 4.5G, which extends mobile broadband networks with support for new services such as Internet of Things (NB-IoT, LTE-M) and public safety. 4.5G Pro takes this further to offer 1 Gbps user downlink data rates – ten times the speed of initial LTE user devices. 4.9G is the penultimate step, bringing LTE-based network performance as close as possible to 5G levels. With 4.9G, we can provide a seamless service experience for subscribers beyond the initial islands of 5G coverage. It also acts as a viable technology alternative to operators without the spectrum for an early deployment of 5G. 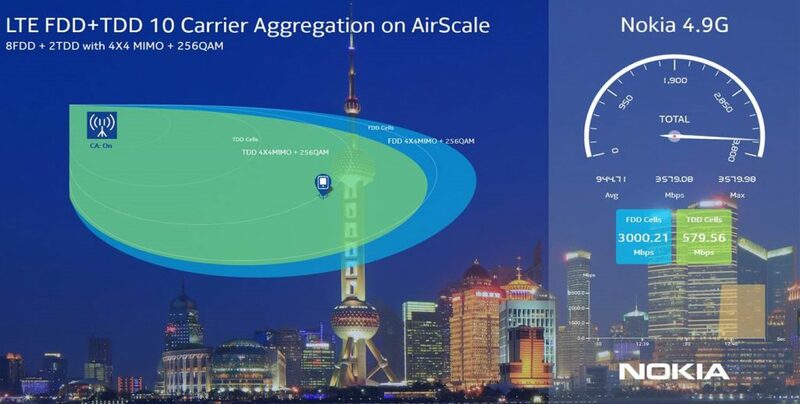 Key functionalities of 4.9G include massive MIMO for up to five-fold capacity, using existing spectrum and macro sites, and data rates of up to 3 Gbps. Latency is also dramatically reduced to below 2 ms, while it also offers Cloud RAN and 5G-interworking. These steps are based on 3GPP-standardized enhancements of LTE, ensuring backward compatibility with the huge LTE ecosystem. TD-LTE is the key to making 4.9G viable. Today, the technology serves around half a billion of the world’s two billion LTE subscribers, but it is still largely unused. TD-LTE has two major advantages for 4.9G. The first is peak throughput and who doesn’t like a high peak downlink throughput? TD-LTE has a lot of spectrum, close to 800 MHz and 3GPP Release 13 allows 32 Carrier Aggregation. This can deliver a huge number of gigabits in the downlink. The other is providing high network capacity. When you run a 4.9G network with a 5G-like user experience, many people will want to join it - the result being that you’re are at risk of running out of network capacity. TD-LTE’s largely unused spectrum, when combined with FDD carriers, can solve this. Operators can offload to TD-LTE, while Carrier Aggregation automatically delivers network load balancing. Nokia AirScale Base Station can deliver TDD and FDD from the same unit in the most compact form. Nokia has shown FDD-TDD with 10 carrier aggregation, 4X4 MIMO, 256QAM using a few slots from a single unit of Nokia AirScale baseband, the Nokia AirScale System Module, at MWC-Shanghai 2017. This is the most compact baseband for the given high capacity, offering multi-connectivity, integrated transport, built-in security and GPS capabilities. The result is a 5G-like user experience providing over3 Gbps peak downlink throughput – enough speed to download an HD video clip in a fraction of a second! Do you have unused TDD spectrum and want to offer a 5G-like user experience even before you deploy 5G? Contact your Nokia representative and we will be happy to help. As the head of TD-LTE Business Product Management, Xuegang Huang is responsible for Nokia global TD-LTE product line. A trusted thought leader in 2G, 3G, LTE/TD-LTE-A Pro technologies, Xuegang is a valued speaker at industry forums and has filed 10 patents during his 15 years of experience in the field. He holds an M.Sc. in Electronic Engineering from the University of Electronic Science and Technology of China. US opens 3.5 GHz “innovation band”; let the automation era begin!